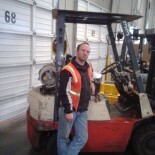 Faith musings from the seat of a forklift. Lying is a serious problem in the United States and much of the civilized world. Too often we tell lies for the sake of convenience or because we don’t like the truth. Sadly, especially in the United States, it has gotten to the point where truth has become the new hate speech. Unfortunately, lies can be dangerous, even deadly. Lies regarding freight have been known, via mis-declarations of contents or specific federal handling guidelines (such as safe handling temperatures), to be outright deadly. Sadly, we often lie during the holidays as well. Personally, I have never encouraged belief in Santa Claus, the Easter Bunny, or the Tooth Fairy. However, and despite my advising against it, I do know a good many people who tell their children about these mystical beings who bring presents (or money) to children based upon some sort of precondition. For Santa Claus, that precondition if behavioral. For the Tooth Fairy it is the loss of a tooth. Though it is not commonly discussed, the precondition for the Easter Bunny is also behavioral. Now, let’s be honest, for Santa and the Easter Bunny, none of us are truly good enough for them to ever come for a visit because as it is written “all have sinned and fall short of the glory of God”. As for the Tooth Fairy, that critter would, by necessity, have to stop visiting after about age seventeen anyway, and it seems to have no moral compunctions. 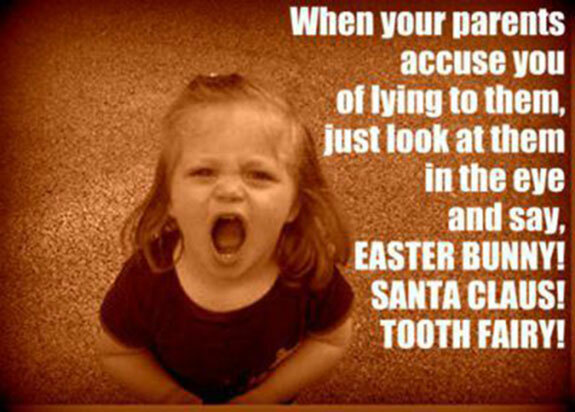 This doesn’t even take into account how any of them would know where you live, or that they would all be guilty of breaking and entering, not to mention that Santa and the Easter Bunny might also be guilty of stalking. Yes. I’m going there. When you tell somebody a lie, no matter how innocuous it may seem, it is still a lie. It doesn’t matter what it is you are lying about, be it something in your online profile (Facebook, Twitter, LinkedIn, etc), Santa Claus, or your age, you are still lying. Some might be tempted to argue that it is their truth, but that is also a lie. As I have said already, our society has gotten to a point where truth is the new hate speech. Why is that? Because truth doesn’t care about you, your feelings, or what it is you want to believe. Truth exists because it is truth. In John 18:38 Pontius Pilate asked the question “What is truth?”. In his case, he was attempting to understand what Christ Jesus meant when he said “You say that I am a king. For this purpose I was born and for this purpose I have come into the world—to bear witness to the truth. Everyone who is of the truth listens to my voice.” Yes, Christ Jesus came to bear witness to the truth, and it is his birth that we commemorate at Christmas, not a fat man riding a magic sleigh in the sky, drawn by eight reindeer. Now, let me ask you, do you really want to be a liar? I don’t. Christmas is when we commemorate the birth of Christ Jesus, the only begotten Son of God. As for Santa Claus? As he is commonly taught to children, he doesn’t exist and has never existed. However, as a real person that once lived and breathed, he did exist, and he would point to manger, and declare himself a servant of the baby lain in the manger. However, I am going to defer to an expert here, please see the video below for more about the REAL Saint Nicolas. Lying is wrong regardless of the reason. That most especially includes the holidays. We need to stop all the lying, and start accepting the truth, and in the United States, the truth is that Christmas is the commemoration of the birth of Christ Jesus. I suspect that this is true throughout much of the civilized world. Without Christ, there is no Christmas. Without Christ, there is no salvation. You can lie all you want, denying this, but it doesn’t make it any less true. Special thanks to the Lutheran Hour for presenting this video. This entry was posted on 25/12/2017 by Christopher Rose in Uncategorized and tagged Christmas, Easter Bunny, hate speech, Lutheran Hour, lying, Pontius Pilate, Santa Claus, Son of God, Truth, United States.